We can learn a few things from one of the best coaches of all time. Today, Bill Belichick is often cited as the best NFL coach. Just last year his team earned its 5th Super Bowl championship. The first came in 2001. That’s a 15 year span of success where the team also reached two other Super Bowls and four other conference championship games. I don’t like hero worship. I don’t believe anyone to be perfect. And Belichick certainly isn’t perfect. There seems to be a little (or perhaps a lot) of the win at all costs mentality to him. He’s crossed the line in NFL rules. He also bizarrely went back on his word to coach the Jets before the 2000 NFL season. But even with his faults, it’s still possible to learn a lot from his success and how his habits, traits and actions foster that success where so many others in his field struggle. Here are a few leadership lessons from Bill Belichick. Two things come to mind with this lesson. 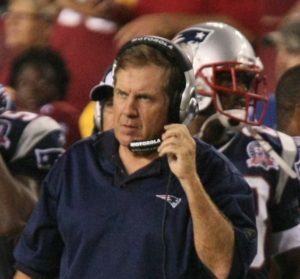 First, Belichick was fired from his first head coaching job in Cleveland. It seemed he had the team turned around in 1994. Then the owner announced the team was moving and 1995 turned into a mess. Imagine working your entire life to be one thing: a successful head coach. You finally get the opportunity. You see progress and then it’s stripped away. Belichick kept going, kept moving forward. He was an assistant again for a few years before his opportunity in New England. That’s a pretty long time in between gigs. Could most people be that patient and resilient? I don’t know. Second, just last year the Patriots competed the biggest comeback in Super Bowl history. In golf, some players are called “grinders”. They grind when they don’t have their best game. They finish with a good score when they don’t have their best. Not many have that ability. Tiger Woods was perhaps the best grinder ever. Anyone can do well when they’re on their best game. The Patriots will blow teams out. But the Patriots are the ultimate grinders in football. They find a way to win games even when they don’t have their best and they did it in that Super Bowl. Speaking of failure, in life you don’t control everything. It seems obvious that Belichick is a control freak. He loves control. But I do think he realizes that he can’t control everything. I think he focuses on the things he does control. He can’t control the Cleveland Browns owner throwing the team into chaos. When the world around you makes bad decisions you can’t control it. You can only control your reaction to it. And Belichick always focuses internally and figures out a way to move himself and his team forward. A few coaches and players that have worked with Belichick have said that he doesn’t ask others to do what he doesn’t or wouldn’t do himself. The Patriot organization almost has a brainwashed trait to them. A couple other successful teams seem to have the same thing. It’s weird, but it’s important. They follow the leader. Belichick sets the standard for others to follow. When you tell someone to do something and you don’t do it yourself your instructions fall on dead ears. You have no credibility. You’re a hypocrite. That approach doesn’t work. Belichick is often chided for his monotone, calm demeanor. People, especially fans and reporters want more emotion. But emotion would only be entertaining for outsiders. And Bill doesn’t care about that. He knows that calmness is the best approach to things that happen in life. Too much emotion leads to poor decision making. It leads to situations where you forget preparation. Bill is remarkably calm in difficult situations. It rubs off on his team. People fear the quiet ones. At least the loud ones tell you their intentions. Bill is a quiet guy. He doesn’t say much. Not to the press. It doesn’t seem like he says much during games. And there is an unwritten rule in life that you’re not required to spill your guts. It’s a cliche, but it’s true. You learn more by keeping your mouth shut. Bill Belichick is a learner. Bill seems to have an incredible focus on the long-term. He will use a gimmick here and there, but he seems to know that gimmicks are only short-term bandaids. Instead, he looks to build for the future. He doesn’t let emotion come into player negotiations. He’s not afraid to move on from a player when he sees the future being negative. In business, focus on what you want to accomplish in the long-term. If you’re focusing too much on the short-term it leads to bad decisions. Bill has a mentality that he wants to get the best out of each player. He has his philosophies for football, but he adapts better than probably any coach. If his roster looks a certain way he’ll change the entire offensive or defensive approach. It’s not about forcing players to do things they’re not designed to do. It’s about getting the best out of each player based on their skills. Everybody has different physical skills. Bill Belichick doesn’t always have the most physically gifted players. Heck, Tom Brady looks like a statue at times. Fans get enamored with great physical play by players. But Belichick looks at the mental side of football perhaps more than anyone else. Tom Brady is not the most physically gifted quarterback, but he might have the highest mental acuity of the game of any player ever. That comes from Tom himself, but also from Bill. He prepares his players mentally probably more than any other coach. Bill has been described as incredibly prepared. He doesn’t want any surprises when the game arrives. He wants every stone uncovered by his staff. He wants his players to prepare more than the other team. And the preparation always seems to go back to basic fundamentals. The coaches look at film the same way. The players do the same drills. It’s simple, but not easy to do these things. It’s mundane. But the teams that do the basics over and over are ready for anything when the game comes. Preparation reduces anxiety. Fundamental breakdowns appear when players tire unless they’ve done those fundamentals so many times that it’s beyond mental. It’s reactionary. Belichick coached for Bill Parcells and one thing he learned there was the strategy of taking away the best player on the other team. And Parcells believes that Bill still follows this formula for winning today. Heck, when you find something that works there is no need to change it. Keep doing it over and over until it stops working consistently. Sometimes humans seem to change for the sake of change. Not because the change is good or better. Just for the sake of doing something different. There are a number of stories of Bill doing generous things for others. But he never seems to talk about them himself. That’s always been something I admire in people. Sweat the small stuff is a reason why Belichick is successful. Anything, any little detail that he or his staff uncovers could be the edge they need to win the game. Some of the most successful people have focused on the small details. Steve Jobs worried about the design of internal elements of computers and phones. Others didn’t care. But that focus on detail spreads throughout everything a team does. John Wooden taught his players how to tie their shoes a certain way. Do you think other coaches worried about that? It’s amazing to look at Belichick’s list of accomplishments. It really is without compare. Now, I don’t think he’s a hero worthy of worship. But we can certainly take some of his quality traits and use them to help guide us to success in business.